Q. Are the smilies free to use? Yes, all smilies are free to use however you wish. All you have to do is copy and paste the URL's below the smilies. If you are a webmaster or forum administrator then please do not hotlink our images. Please download them and upload to your own web space/server. 1. Copy the smilie's URL. 2. Paste the URL into your forum post. 3. Enclose it with [img] and [/img]. 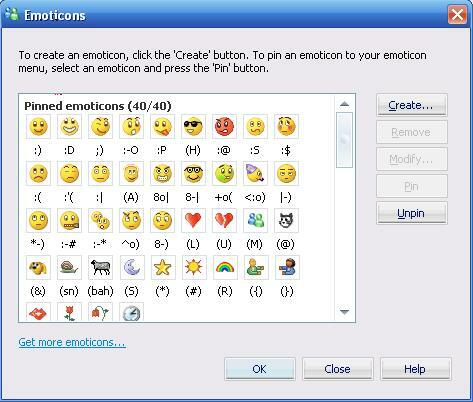 Nearly all image types can be added to MSN as smilies . Jpegs and GIF’s are recommended, but bitmap images and PNG’s can be used as well. The only thing to keep in mind is that MSN may automatically resize your image into to 19px by 19px. 1.In your main window, go to tools, then emoticons. This will bring up a window with all your available emoticons followed by the keyword short cut used to activate them in chat. 2.Click "Ceate" to bring up the Add a Custom Emoticon option. 3.Click "Find Image", then browse to find your chosen image. 4.Enter a keyboard shortcut. Like with other emoticons, you can add keyboard shortcuts to make your emoticon come up whenever you type a certain phrase or sequence of characters. 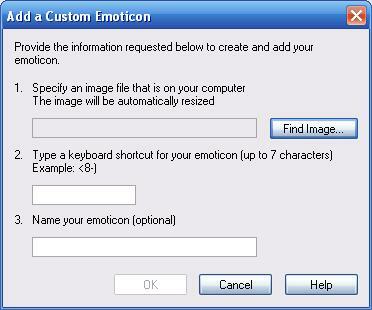 5.The last option is optional however if you want to name your emoticon then enter it in the last box on the screen. When you have done that, click ok.
6.Congratulations, you have successfully imported your smilie into MSN. Copy the highlighted text, the smilie is now ready to be pasted.